Rule the playground with our standout machine washable insulated kids cooler bag. Elevate mealtimes with smart design details like a removable insert for quick cleaning, and a messenger/backpack strap for unburdened ease of movement. Oh - and don't forget to write your superhero name on the inside tag! Our adorable Grey Robot is programmed to always be on the lookout for fun - and to keep you looking like the master of the playground. 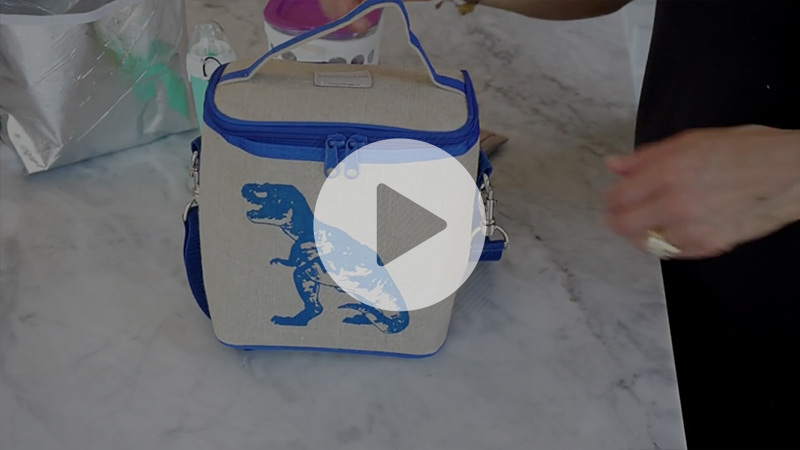 My son loves this cooler bag and it has a practical purchase. It easily fits everything he needs, it's easy to clean and also it's just so adorable! I love the use of linen and the philosophy of this company too. Can't go wrong. I send my kindergartener and 2nd grader to school with these. I just wish they had a water bottle pocket or that the pocket were a bit deeper. Overall I love these bags and just stocked up. My daughter stole my bag. Bought this bag to save as a gift, however, my 24 year old daughter took it from me. Nice size and the quality is very nice. Most of all, she loved the print. I purchased this for my son because I was so happy with the unicorn version of this lunch bag that I bought at a local Wholefoods store for my daughter 2-3 months ago. So far no problems with this one but the silver/metallic coating on the inner liner in my daughter's bag seems to be coming off so that one bottom corner is now translucent (I can see my hand through it if I hold it up to the light). I'm not sure why this is happening or if it is anything to worry about. Is this common or is something wrong with her bag? Will it affect the insulation? Otherwise, I love that these lunch bags are upright so that to food (like yogurt and berries) that I put in stays upright instead of in their previous lunch boxes which get tipped sideways when carried by the handle so food gets dumped into the container lids and makes a mess when the kids open them. Of course, that can happen to this one too if they drop it on it's side but at least the default position is right-way up! I also love that the liner insert that the food is put into is super easy to take out and wash in the sink and that the outer part is machine washable (others got really grimey despite my best efforts, which were admittedly somewhat limited since I am a working mom) and that they are made at least partly from natural linen instead of all plastic. My daughter loves the shoulder strap. She likes to carry it on her shoulder like a purse and fill her backpack with library books instead! My 8yo daughter was so excited when her new lunch bag arrived! I love how well-made it is with the sturdy linen. It will definitely stand up to being squished in a school locker.